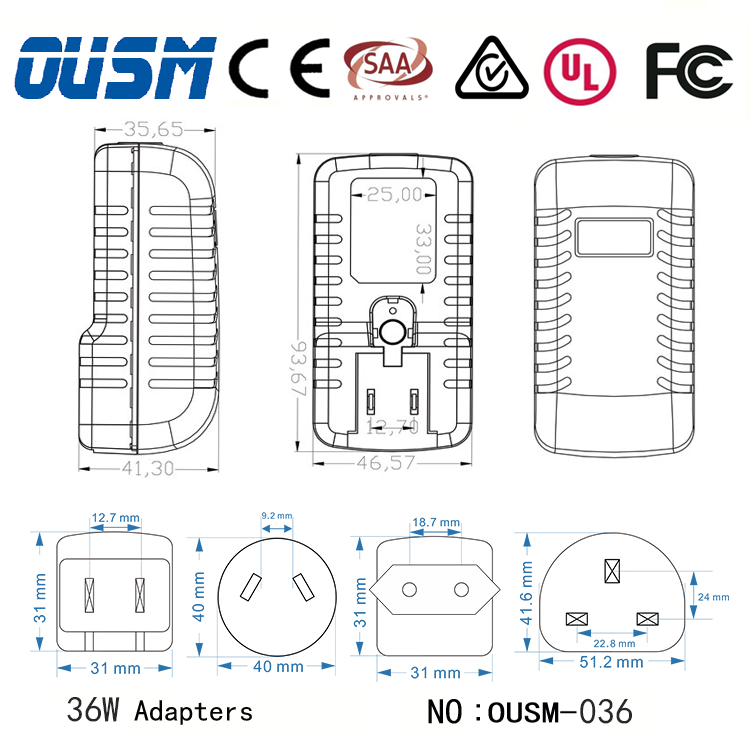 Welcome to Oushangmei Power Adapter Technology Co.,Ltd.OUSM offers high quality interchangeable plug power adapter items.Numerous types of exchangeable plugs ac adaptor alternatives are for sale with Wholesale Price,You can choose from 5V 9V 12V 15V 19V 24V 36V etc. Over voltage protection : Yes. Auto-recovery. Over current protection : Yes. Auto-recovery. Load regulation : ±5% variations from minimum to maximum output voltage or current. Operating temperature : 0°C ~ + 40°C. Operating Relative Humidity : 5% to 95% non - condensing. Withstand Voltage : 110v-240v 50Hz. EMI Requirements : CE : Emission:EN55022; EN61000-3-2,3/ Immunity; IEC61000-4-2,3,4,5,6,11 FCC 47 CFR . Safety standards : (A)UL60950-1 CSA C22.2 (B)EN60950-1; IEC60950-1. 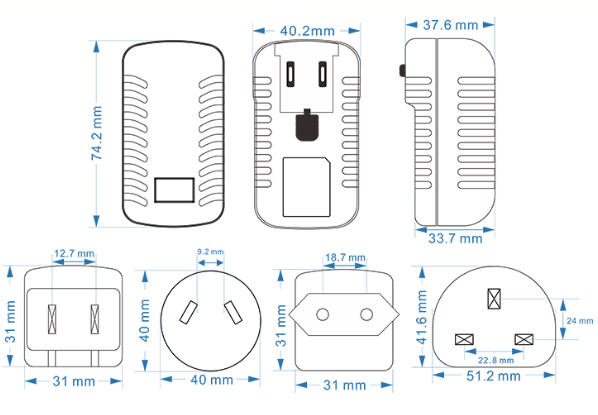 All these Interchangeable Power Adapter Meet UL, CE, GS, SAA, FCC, EMC. 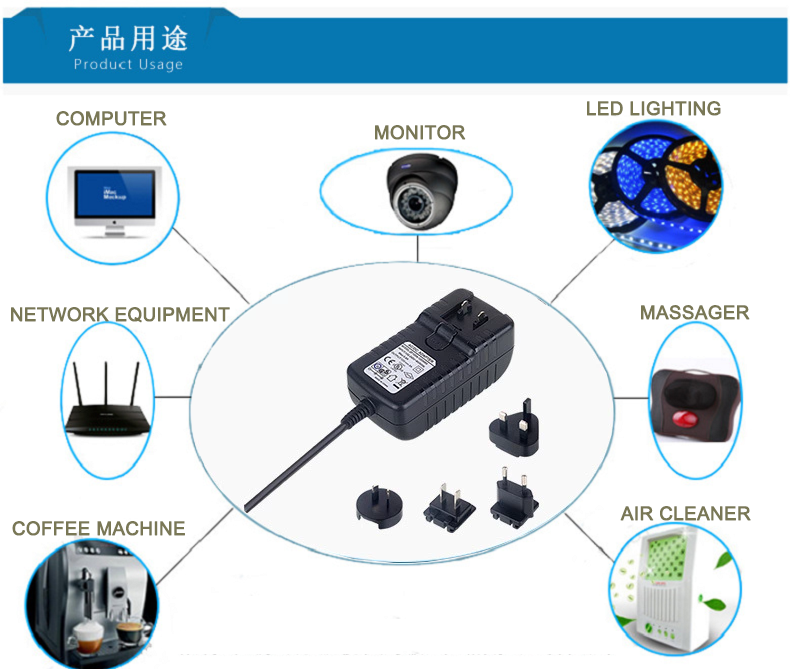 Scope: Table lamp, Electronics, LED products, CCTV, communication devices, Radio, Motor-driven Appliance, Heater, Water Pump, Toy, Security Protection, coffee Equipment, etc. 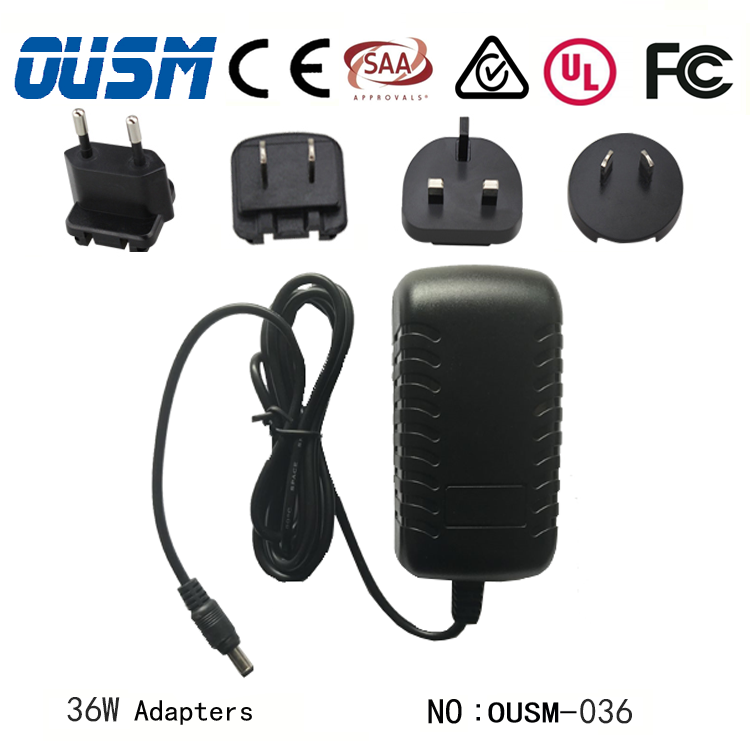 The Ac dc power adapter is a kind of external power source, generally enclosed in a case just like an AC plug. Adapters for battery-powered devices might be referred to as battery chargers,rechargers or wall chargers.AC adapters are employed along with electric gadgets that need power but don't have inner components to gain the necessary voltage and power from mains energy. Every AC/DC power adapter is created to take a specific AC input (most of the common output from a 120 V AC outlet in your house) and transform it to a certain DC output. Similarly, every gadget is created to take a specific DC input. The key is to fit the DC output of the power adapter to the DC input of the gadget. Identifying the outputs and inputs of the adapters and devices would be the challenging component. The positive plug should mate with a negative receptacle or vice versa. Direct current, naturally, is really a one-way road, and stuff just won’t work by trying to go up the downspout. 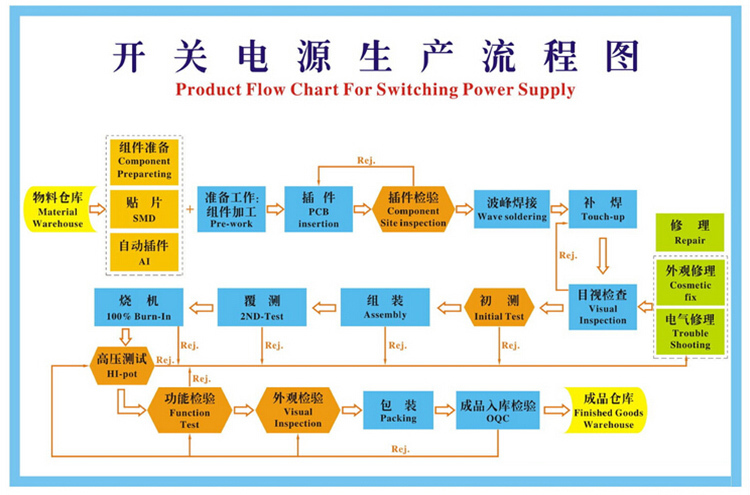 Shenzhen Oushangmei Power Technology Co., Ltd. is known as a top Producer, Vendor and Exporter of Switching mode Power Supply & Adapter,that has a manufacturing facility in Shenzhen China. We stock and export regularly top quality Switching Power, Medical Adaptor, Power over ethernet Adapter, USB Phone charger, Waterproof ip67 power Adapter & LED Driver, Interchangeable plug power adapter.Our power adapter factory frequently enhance the producing procedures and work environment via whole worker engagement and rigid sticking with the honest enterprise values. We've received a number of clients in the field of ac dc power adapter.Our truthfulness and hard work helps us to complement our top quality along with intercontinental requirements. Our coverage is always to reach the customers' approval both by offering them with top level Ac dc Power Adaptor and services which fulfill or go beyond their requirement. It's the drive to produce ac adapter products to match the exact require for our buyer ranging from small businesses to big producing factory.We're providing our customers the world-class selection of Ac dc Adapters. 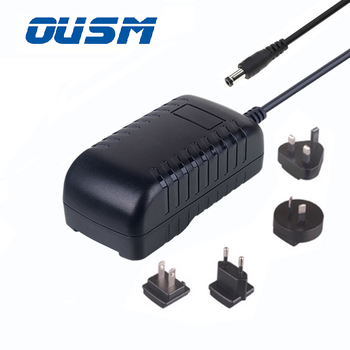 Wall mount ac adapter with interchangeable plugs offered by OUSM.This kinds of power adapter is appling for Mobile Products,Routers, Computer Equipments & CCTV Projects.and much more at Shenzhen Oushangmei Adapter Technology Co.,Ltd. You can feel confident with our affordable price guarantee. 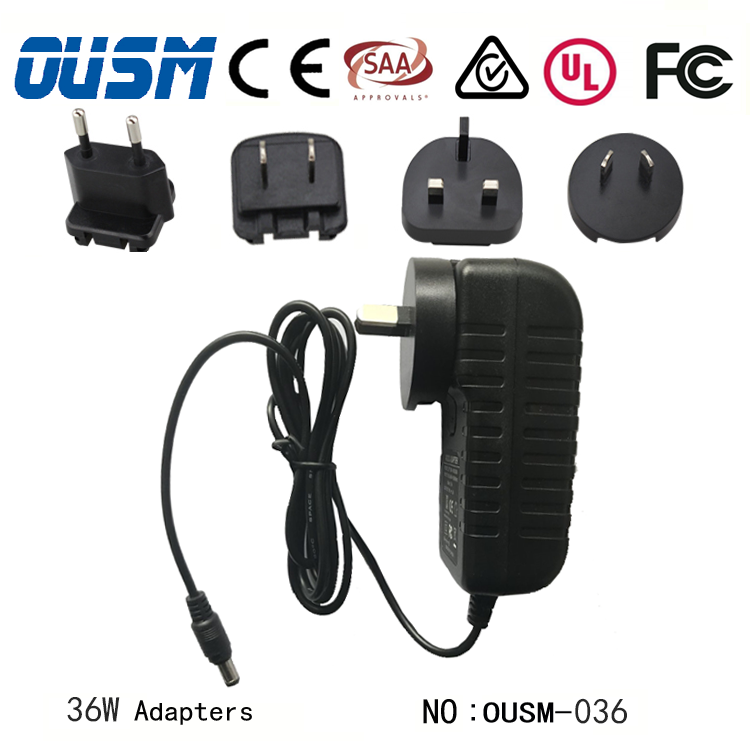 If you're enthusiastic about any kind of power adapter series items, don't hesitate to write us. 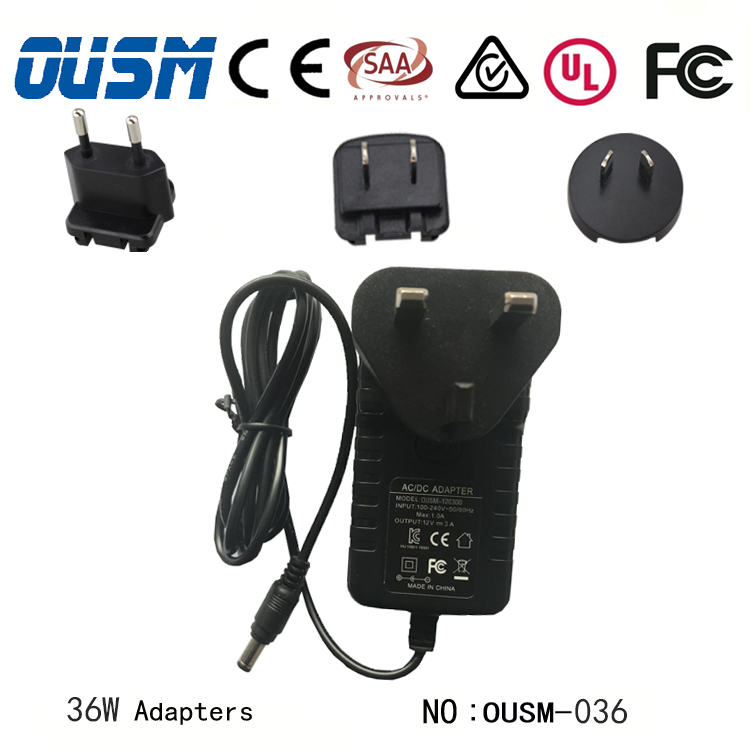 Switch mode power adapter with interchangeable plugs of EU US AU UK KC etc.All products met the UL CE FCC SAA RoHS C-tick.Keep in mind that all the interchangeable adapters are wall mounted. 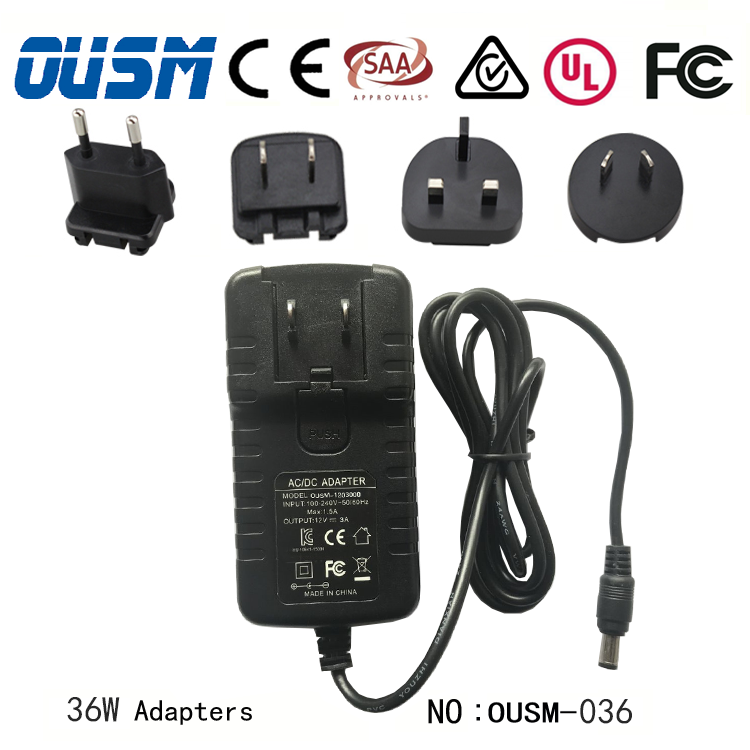 This amazing power adapter comes with an input voltage of 110 to 240V ACIt arrives with several unique plug kind (US, EU, UK, AU,KR etc) therefore it is ideal for traveling. The Interchangleable plug adapter Features: Efficiency level VI, Overload protection, Overvoltage protection, Constantly short circuit resistant. Wall-mounted Style Interchangeable/Exchangeable Plug Power Adapter. The best and trustworthy efficiency. 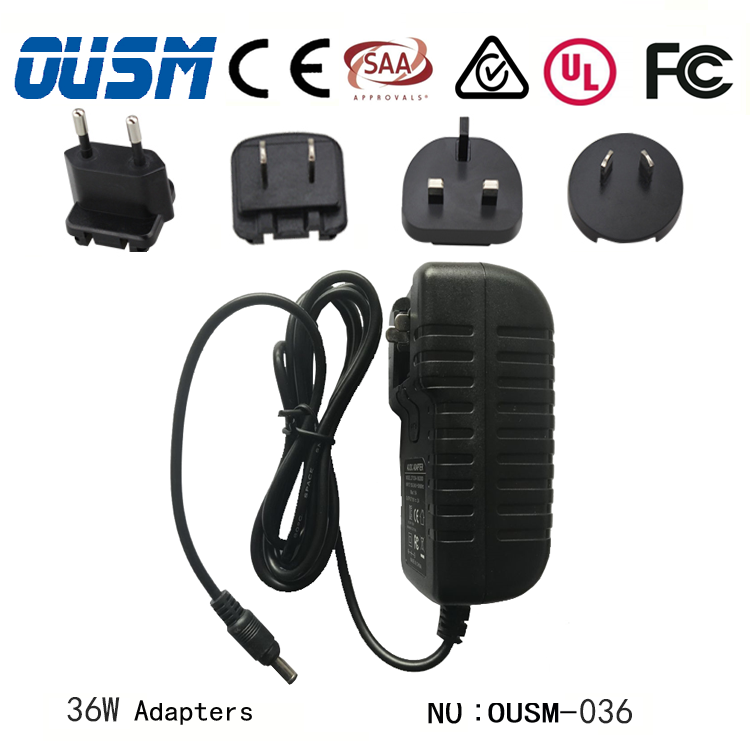 All ac adapter units can be provided as standard or customized models to suit your needs or special demands. 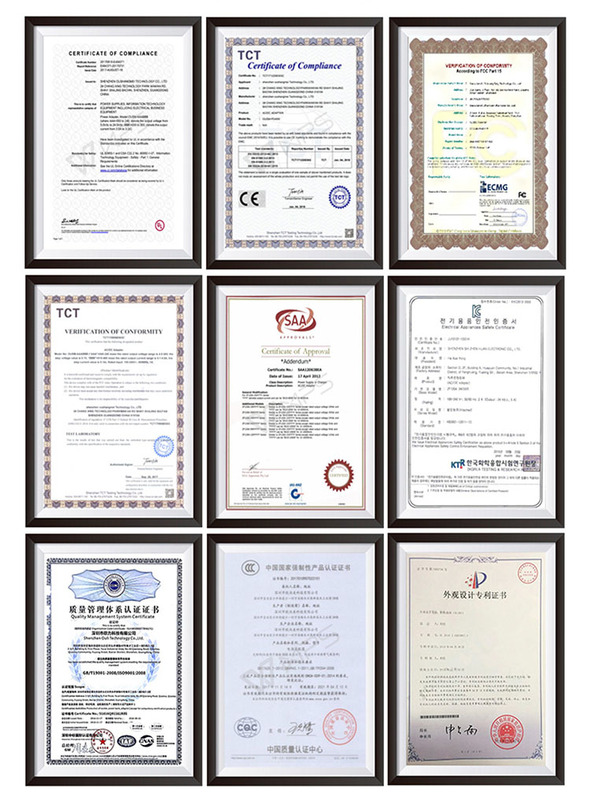 The items are maked UL, CUL, FCC, CE, CB, SAA, C-Tick safety Lable. 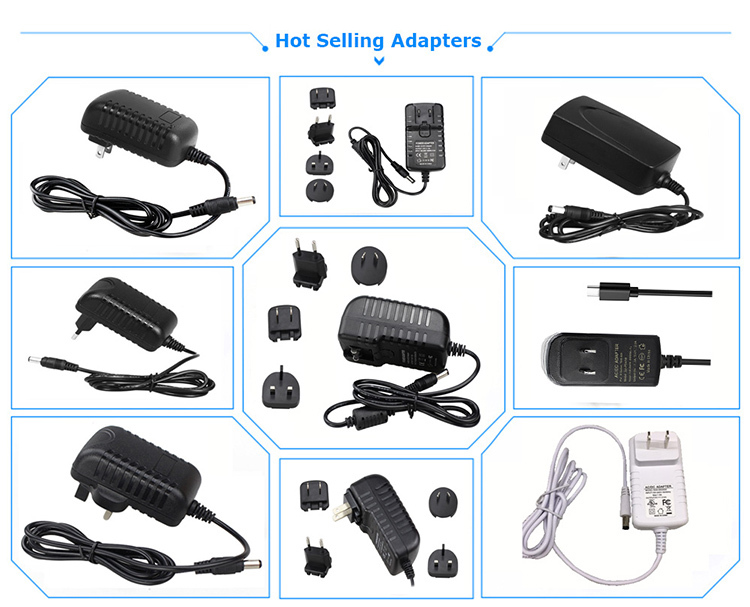 Interchangeable AC plug power adapter,exchangeable plug ac adapter,multiple plug ac dc power adapter,interchangeable plug power supply. Can you let us know the details for recommending you the perfect ac dc power adapter? Three)What is the adaptor combined with? for example:CCTV, LED lights, toys,motor,rounter? 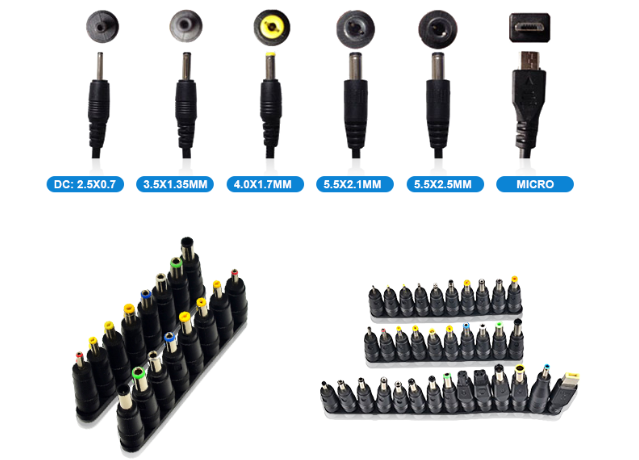 You can claim our interchangeable plug power adapter for free 1-3 samples, or pay for more than 3 pieces of the interchangeable adapter samples.